The Ariane 5 rocket to launch Europe's Herschel and Planck telescopes is seen awaiting its payload. PARIS - Thelaunch of Europe's Herschel and Planck astronomy satellites, which had beenscheduled for April 16, has been delayed for about two weeks to give Europe's ESOCmission control center time to verify recently added flight-simulationsoftware, European Space Agency (ESA) officials said March 13. JacquesLouet, ESA'shead of science projects, said the two satellites are in good shape atEurope's Guiana Space Center in French Guiana and that the delay is only togive the Darmstadt, Germany-based ESOC control center time to de-bug a newsoftware system that will monitor the satellites during their launch and earlyoperations phase. Louet said ESOCteams expect to complete the work by March 27. If that occurs, the launchcampaign will resume, starting with the fueling of the satellites and theirintegration onto a single Ariane 5 heavy-lift rocket. Under current planning,Louet said, the launch would occur April 29 or April 30. Thecombined Herschel-Planck mission is the most expensive science package everlaunched in Europe. Its budget is estimated at about 1.6 billion euros ($2billion), including the satellites' construction, launch and in-orbitoperations. The Arianespacelaunch consortium typically needs about four weeks between launches. The Evry,France-based company is preparing the launch of SkyTerra Corp.'s TerreStar-1mobile communications satellite for May 28. The 6,700-kilogram TerreStar-1 willbe a rare solo commercial passenger on Ariane 5. 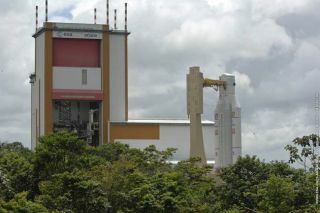 Arianespace officials saidthat the late-May TerreStar-1 launch does not need to be delayed if theHerschel-Planck mission is completed by April 30.